grade-school child I would still get pinched even though I was wearing green. Those Leprechauns are little stinkers! CLICK HERE TO HAVE THIS WEEKS RECIPE'S AND TAGS EMAILED TO YOU! I don't eat or prepare traditional Irish food. 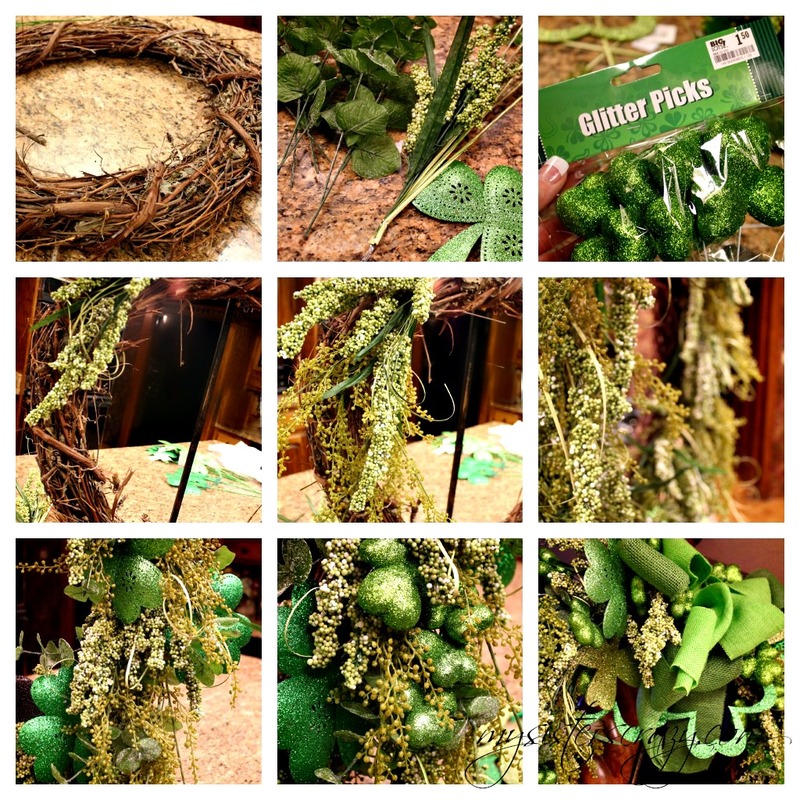 This being said, anything green is a "GO" at our St. Patrick's Day celebration. I know a lot of people go the way of mint when they think of green food, not me, I go lime! These lime cupcakes serve both of my color and taste needs this March. They are fresh and D-lish! I love the color and flavor that the strawberry adds to these lovely little lime cakes. It's the perfect accent to the "I'm not Irish but kiss me anyway!" declaration that has been staked in the top of the cupcakes. 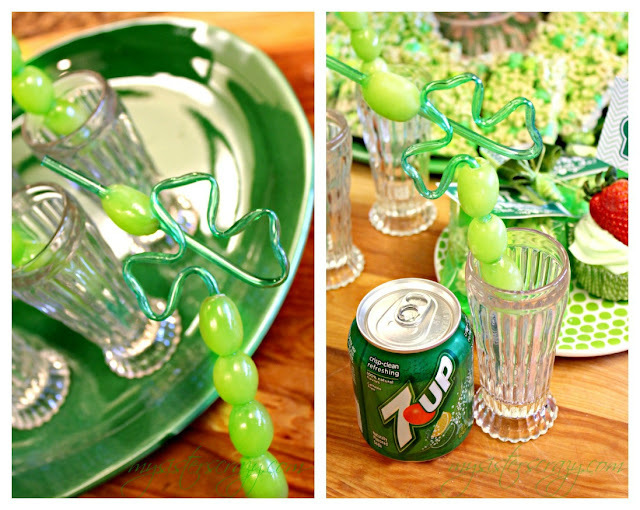 My next favorite offering for a St. Patrick's day party is also a fruit... a green grape straw. Not only do green grapes slide perfectly onto a crazy clover straw but, they freeze remarkably well. After the kids have helped me put the grapes onto the straw, I put them in the freezer. Once frozen, I put a straw into a clear glass and pour on the beverage. In this case, I didn't want to work too hard...tiny 7up cans are the perfect color and thrill my kids every time! The frozen grapes take the place of ice so the soda is nice and cold but, doesn't get watered down. 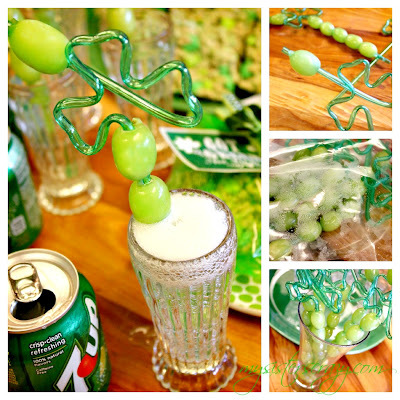 My kids love making these, eating them, and using the crazy clover straw...I would call that a win! For my next trick there will be no fruit. In fact, NO nutritional value at all. They are however, yummy and adorable. Did you know that this time of the year they make all green clover Luck Charms!?! They do! (I found these at Walmart.) How lucky can a girl get!?! I am going to admit that I loved Lucky Charms as a child. I would fish around the actual cereal and try to get as many marshmallows on my spoon as I possible could. My love for this cereal has somewhat changed, I do however enjoy a good cereal and marshmallow treat every now and then! 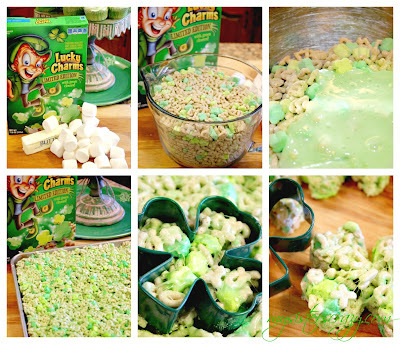 These made great cereal bars...PLUS....all green clovers...WHAT!?! I am so happy right now! I cut some of them into clover shapes using my trusty clover cookie cutter and left some cut in squares. The clovers are look adorable. The texture is soft even thought the cereal is a little harder than Rick Krispies. Still, it works great and my kids like them. These work well with regular Lucky Charms too. However, these are perfect for the holiday. Finding these made me feel like I had found the pot of gold...MAN, I need a little bit more excitement if this box of Lucky Charms is making all my dreams come true! The package will keep them fresh and soft. I love the little tag and all with the treat app packaged up, I think they make a cute little gift. I have a "thing" for velvet ribbon. My heart feels like velvet is the most beautiful ribbon in the whole world. 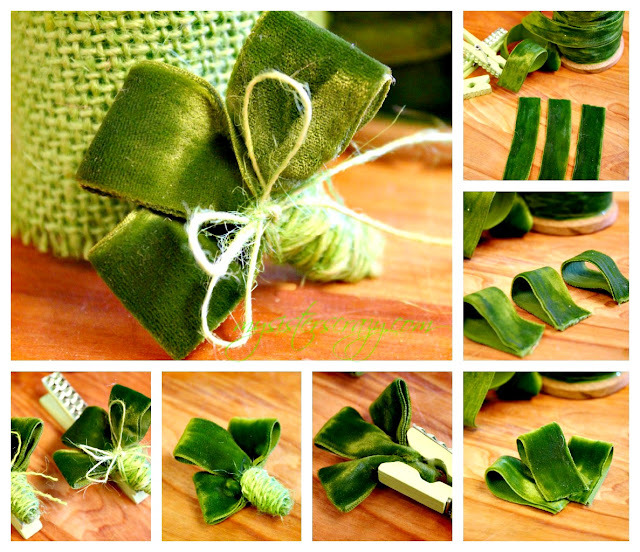 This deep green velvet has served me well for many crafting projects. I have not been able to stop thinking about it for the past several days. I figured it would make the perfect clover to adorn my treat packages! I am not Irish…..so what!?! I wanted to get in a few St. Patrick's Day Crafts in. St. Patrick’s Day is the door way to spring! Who doesn't love a reason to craft or celebrate? My holiday preparations always begin with the front door. First impressions are very important! I seldomly purchase a premade wreath. I don't want something that everyone else has. If I do purchase a premade wreath I change it up so much you wouldn't recognize it. Wreaths are a good DIY project that spices up the front porch and sets it apart from all the neighbors. I like to make a front door wreath as big as I can possibly get it and still be able to open the door! The bigger the better! This guy went together rather quickly. I used the biggest grapevine wreath the craft store had. Layered it with green grass, berries, and other green filler. When the wreath was nice and full, I began layering in the shamrocks. I used shiny, glittered, and metal shamrocks of all sizes. Lets just say I really sham-rocked this wreath up! I used two different colors of burlap ribbon to tie a big bow on top. The bow also holds giant glittered shamrocks that hang in the center of the wreath. I like mixing textures like; burlap and glitter, shiny and natural, really big with really small. I think it keeps things interesting! This St. Patrick's Day wreath will only hang on the front door for a short time, Easter is two week after St. Patrick's Day this year. It's time on the door may be a short one but, it will be a glorious one! I think this is a beautiful beginning to a fantastic spring season!